The Rebel t5i has specific options for taking still portraits. By still portrait, this means that your subject isn’t moving. Assuming that you do have a subject willing to pose, the classic portraiture approach is to keep the subject sharply focused while throwing the background into soft focus. Set the Mode dial to Av (aperture-priority autoexposure) and rotate the Main dial to select the lowest f-stop value possible. A low f-stop setting opens the aperture, which not only allows more light to enter the camera but also shortens depth of field, or the range of sharp focus. So dialing in a low f-stop value is the first step in softening your portrait background. To further soften the background, zoom in, get closer, and put more distance between subject and background. Zooming in to a longer focal length also reduces depth of field, as does moving closer to your subject. And the greater the distance between the subject and background, the more the background blurs. A lens with a focal length of 85–120mm is ideal for a classic head-and-shoulders portrait. But don’t fret if you have only the 18–55mm kit lens; just zoom all the way to the 55mm setting. You should avoid using a much shorter focal length (a wider-angle lens) for portraits. For indoor portraits, shoot flash-free if possible. Shooting by available light rather than flash produces softer illumination and avoids the problem of red-eye. To get enough light to go flash-free, turn on room lights or, during daylight, pose your subject next to a sunny window. In the Av exposure mode, simply keeping the built-in flash unit closed disables the flash. If flash is unavoidable, see the list of flash tips at the end of the steps to get better results. 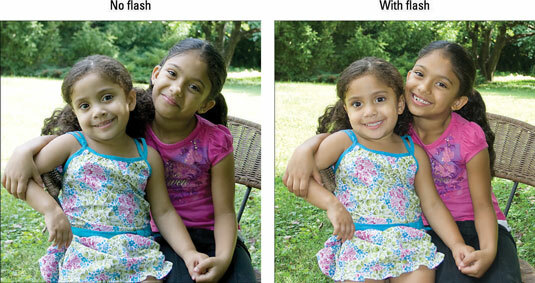 For outdoor portraits in daylight, use a flash if possible. Even in daylight, a flash adds a beneficial pop of light to subjects’ faces. A flash is especially important when the background is brighter than the subjects, as in this example; when the subject is wearing a hat; or when the sun is directly overhead, creating harsh shadows under the eyes, nose, and chin. One warning about using flash outdoors: The fastest shutter speed you can use with the built-in flash is 1/200 second, and in extremely bright conditions, that speed may be too slow to avoid overexposing the image even if you use the lowest ISO (light sensitivity) setting. If necessary, move your subject into the shade. Press and hold the shutter button halfway to engage exposure metering and, if using autofocusing, to establish focus. The One Shot AF mode and Manual AF Point Selection options work best for portrait autofocusing. After selecting a focus point, position that point over one of your subject’s eyes and then press and hold the shutter button halfway to lock focus. If you have trouble, simply set your lens to manual focus mode and then turn the focusing ring to set focus. Press the shutter button the rest of the way to capture the image. Do a background check. Scan the frame for intrusive objects that may distract the eye from the subject. If necessary (and possible), reposition the subject against a more flattering backdrop. Frame loosely to allow for later cropping to a variety of frame sizes. Because your camera produces images that have an aspect ratio of 3:2, your portrait perfectly fits a 4-x-6-inch print size — but requires cropping to print at any other proportions, such as 5 x 7 or 8 x 10. Pay attention to white balance if your subject is lit by both flash and ambient light. If you use the automatic White Balance setting (AWB), photo colors may be slightly warmer or warming cooler than neutral because the camera can become confused by mixed light sources. For group portraits, be careful that depth of field doesn’t get too shallow. Otherwise, people in the front or back of the group may be beyond the zone of sharp focus. Depth of field may extend only a few inches from your focusing point, in fact, if you’re using a long focal length (telephoto lens), select a very low f-stop value, and position yourself very close to your subjects.